Passing the first section of Candy Crush Jelly Level 12 is very easy, but the second playing field becomes a bit more complicated. You have four 2×2 spaces to spread the jelly in and with the remaining moves, you have to be smarter. 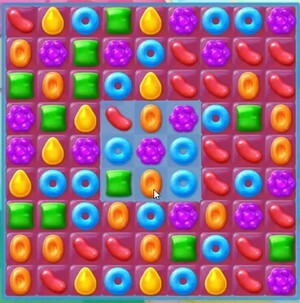 Normal candy matching can spread the jelly, but they will cost you many moves to pass this level. It is advisable to use special candies and mostly the striped candies to pass this level in fewer moves. With six colors in Candy Crush Jelly Level 12, it will be troublesome to create special candies, and thus, you should never miss an opportunity to make striped candies. With a striped candy, you will be able to spread the jelly on an entire column or row depending on the type of candy that you have created.